Following years of building his independent living-skills with BeyondAutism, Post-19 student Adam has received the keys to his own flat! Adam loves his independence and being able to do things for himself. Because of this, he was keen to move out of his family home so that he could continue to control his own life. Adam has been with the BeyondAutism community almost from the start – progressing through primary and secondary education in our schools and now attending our Post-19 service. Over the years he has steadily built up more skills and reached a point where he is able to communicate his vocational aspirations effectively, as well as his preference for how he wants to live. At Post-19 we want to see young adults with autism prepared for adulthood with a skill-set that enables them to have choice and control over where and how they live. 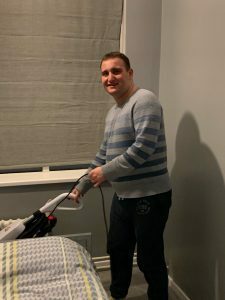 When Adam made the decision that he wanted to live independently he and his family worked hard to achieve this, involving the joined up working of social care, the disability charity Yarrow, and BeyondAutism. Living independently, local to his family but in his own environment is incredibly important to Adam. He is supported by care staff, who help facilitate his choices and ensure he remains in control of how he wants to live. This has been made possibly by ensuring Adam is able to communicate with those around him – particularly around his needs and desires. He continues to improve his communication, and develop his independent living skills, to further reduce the amount of care support required and ensure his life continues to flourish. Adam’s journey shows how specific teaching methods, alongside determined individuals and joined-up agency working can be successful in achieving the right outcomes for young adults with autism.